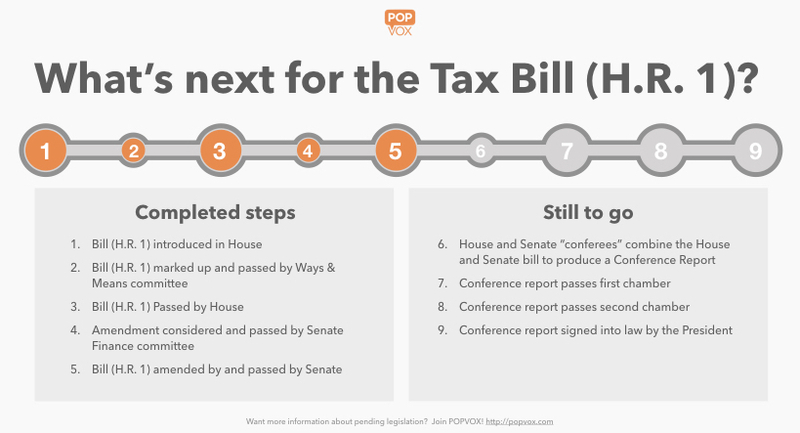 Q&A: What’s next for the Tax Bill? At 1:36 AM on Saturday, December 2, the Senate passed H.R. 1, the Tax Cuts and Jobs Act by a vote of 51-49. The House and Senate must go to conference and produce a joint conference report. According to chamber rules, the Conference report must be publicly available before a vote — 48 hours in the Senate, 3 days in the House. House votes December 4 on a motion to go to conference and appointing Republican conferees. They will also vote on Democratic-sponsored "Motion to Instruct Conferees." Senate will vote on similar motions in coming days. See what other sare saying and write a message to your lawmakers on H.R. 1 with POPVOX.